Mine is here (photo) on the rear edge just above the cables. A)	On my Mariner 25 there is a small restriction clamp on the flexy control cable. It is visible within 18 inches of its connection to the engine. It is in the form of a three sided clamp and has a locking nut to secure the setting of the clamp. Perhaps the clamp is exerting too much pressure on the cable. B)	By removing the connection to the engine you can check to see if the control cable is then free to move and that the engine levers may be the source of the fault. C)	By removing the fridge you can gain access to view the rear of the engine control mechanism. I found it difficult to reach close enough lubricate the mechanism. A long handled ANGLED BRISTLE PAINT BRUSH RADIATOR OR PIPE PAINTBRUSH 3/4" from eBay allowed me to apply lubricant. Also check that the control cable positioning in its run avoids sharp turns. These cables required slow bends to function correctly. 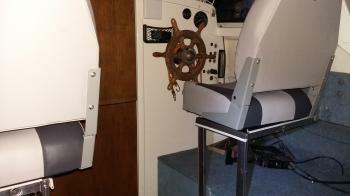 The throttle control on our Mariner 25 is quite stiff and so adjustments to revs and speed can require a bit of a thump on the lever as opposed to a smooth adjustment. Any ideas on how to improve the situation would be welcome.